National Trails Day (NTD) seemed like a perfect opportunity to organize a trail maintenance project into the newly reopened Thomas Fire burn area. NTD is an annual event scheduled for early summer where tens of thousands of people from across the United States come together to volunteer for the trails. With that in mind, the Los Padres Forest Association (LPFA), working in conjunction with the Los Padres National Forest, scheduled a National Trails Day project on Saturday June 2 to begin work on the Matilija Trail outside of Ojai. 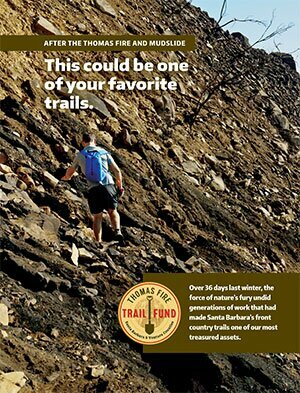 The Thomas Fire Forest Closure had been lifted just two weeks earlier so our work into the Matilija would be an exciting time for the trail community to not only help the trail but also explore the burn area and see first hand the damage that occurred at the hands of the Thomas Fire. More than 30 volunteers arrived in the early morning at Wheeler Gorge Visitor Center on Saturday June 2 and after the required safety talks we took the short drive to the Matilija Trailhead. The amount of damage was astounding as the hills that were once covered in a thick blanket of chaparral were now bare with just a little peach-fuzz of new green regrowth. Similarly, the trail itself was almost unrecognizable with downed trees and enormous washouts at each of the creek crossings. Our adventurous volunteers were organized and got to work. We spent the day removing downed trees, clearing brush and moving rocks off the trail from the trailhead up one mile to Matilija Camp. We then spent a few hours clearing rocks at Matilija Camp in the hopes of reestablishing the campground which had been buried in rocks and mud from the January 9th post-fire debris flows. At the end of the day we walked out of the forest a little dirty and tired but feeling great that we’d started the process of restoring the trails after the horrific Thomas Fire. One mile down, just 124 more to go. Matilija Campground. Buried under that rock is three fire rings and what used to be a campground.